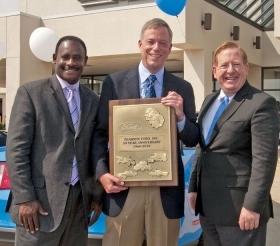 John Pearson III, center, of Pearson Ford in Zionsville, Ind., receives a 50-year award for Ford from Frederiek Toney, left, vice president of Ford's Customer Service Division. At right is Jim Brainard, mayor of nearby Carmel, Ind. 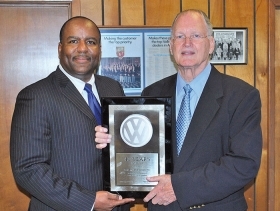 Rod East, right, of Rod East Volkswagen in San Antonio receives a 40-year award for VW from Merriman King, general manager of sales operations for Volkswagen of America's Southern region. 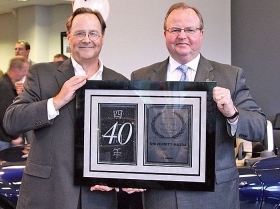 Chuck Anderson, left, of University Mazda in Seattle receives a 40-year award for Mazda from Jim O'Sullivan, CEO of Mazda North American Operations. 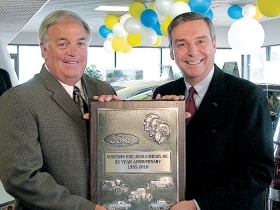 Brad Black, left, general manager of Downtown Ford-Lincoln-Mercury in Canton, Ohio, receives a 25-year award for Ford from John Schuldt, Ford Motor Co.'s Pittsburgh regional sales manager. 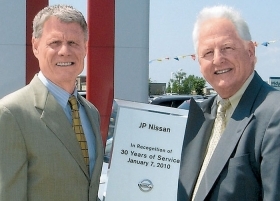 Joseph Leydon Jr., left, of JP Nissan in Peru, Ill., receives a 30-year award for Nissan from Dave Weinstein, Nissan North America's dealer operations manager.